Planks are great because each move shifts your center of gravity making the muscles in the abdominal, arms, back, and glutes work to stabilize the body. Denver’s Stacey Lei Krauss, the creator of a plank-infused cardio fitness program called the Willpower Method, designed this sequence of several variations on the standard plank position. The workout is designed to be done three times a week, taking 30 seconds between each move to roll your wrists and shoulders. It’s the perfect routine to achieve stronger muscles and a toned look without even touching a set of weights. Furthermore, it will improve your posture, help with lower back pain, improve your metabolism and max your flexibility. To understand the full effects of planking see What Will Happen When You Start Doing Planks Every Day. (B) Tuck your toes underneath the feet so that all 10 toes lie flat. Extend your legs and push up hips so that your body is in a straight line from shoulders to heels. Draw in your abs, squeeze your glutes, and keep your head in a neutral position that’s in line with your spine. Hold for 30 seconds. (A) Start in the standard plank position. (B) Elevate your right leg about 3 inches off the ground, point your toes out and keep your leg straight. Making sure you keep the torso still, carefully and quickly move your leg up and down 5 times, firing up your glutes, hamstrings and quads, then go back to the starting position. This is one repetition. Repeat this 9 more times and switch to your other foot and do it 10 times. (B) Raise your right leg 3 inches off the floor, draw your right knee toward your chest and diagonally across your body until your knee taps your left elbow (or your left armpit if you’re resting on your forearms). Return to the starting position. 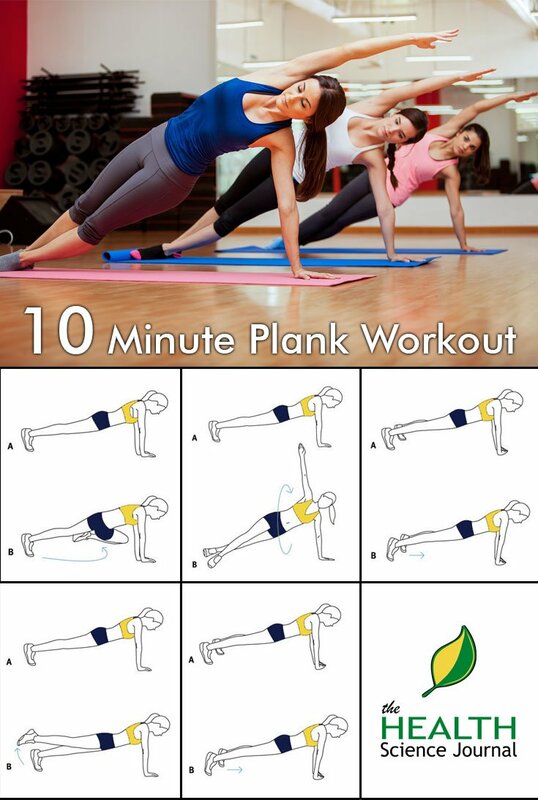 Repeat 9 times, then switch sides and do 10 more. (A) Start in standard plank position. (B) Engaging the abs, rotate your right shoulder and hip up toward the ceiling in a single movement, twisting your feet so that the inside of your right foot and the outside of your left foot rest on the floor. Now extend your arm towards the ceiling and return to the starting position. Repeat 4 more times, then switch sides and do 5 reps as well. (A) Start in a slightly modified version of the standard plank, placing your feet several inches wider than hip-distance apart and your hands underneath your chest. Turn your hands slightly inwards so that your thumbs and index fingers touch to form an upside-down heart. (B) Use your toes to push your body forward so that your trunk aligns over the heart formed by your hands. Keep your chest, back, and triceps engaged and hold for 30 seconds.